Football is America’s sport. And it is, at times, dangerous. Most sports can be. But the concussions, brain trauma and their long-term side effects have become a sometimes deadly epidemic that can no longer be ignored by collegiate and national football leagues. In September 2015, Frontline reported that researchers have identified the degenerative brain disease known as chronic traumatic encephalopathy, or CTE, in the brain tissue in 131 out of 165 people who played football professionally, semi-professionally, in college or in high school. At the University of Washington, faculty and students of engineering and entrepreneurial backgrounds were particularly successful in the formation of VICIS, a company dedicated to commercializing their revolutionary helmet technology. And now the University of Michigan stands among these institutions. 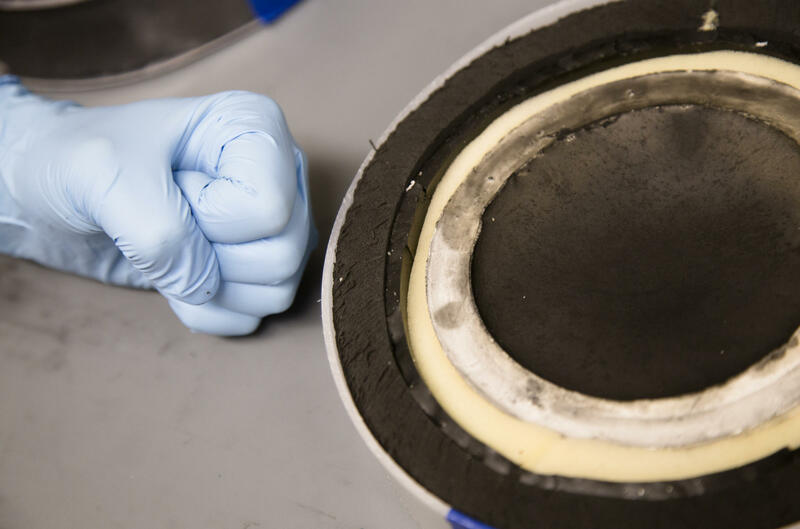 The team of researchers at the University of Michigan School of Engineering has been developing a shock-absorbing football helmet that fights some of the damaging physics that most modern head protection technology ignores. Helmet makers and health researchers tend to look at a variety of factors, but most focus their designs solely on the peak force they can endure. Overall, most scientists and helmet makers are still unsure of how a hit to the head translates to brain injury. The University of Michigan project, called Mitigatium, decided to take a different approach. Researches determined that, in order for head protection to be most effective, the helmets have to protect against both force and impulse. So what exactly is impulse? Science defines impulse as the secondary effect of an initial force that transmits kinetic energy through a system. More simply, it's the reverberating energy that affects an object after it's hit. Why is impulse an important consideration for football helmet makers? Using old medical literature, a series of simulated tests, and drawing inspiration from other helmet designs, the Mitigatium team demonstrated the hidden importance of protecting against impulse. "We looked at all these helmets and determined that when it comes to protecting the skull and mitigating force, they do well. But when it comes to lowering the impulse or removing the energy of the impact, they did very little in dissipating that energy." In Mitigatium's experiments, the teams could tell how little the current model was doing in blocking both force and impulse by how much the speckled pattern on a brain layer was distorted. When the Mitigatium prototype was tested, the impulse of an impact was reduced to just 20% of what went through the brain model in the current helmet model. The video below was released by Michigan's School of Engineering earlier this year as promotion for the research team and its helmet. The University of Michigan Mitigatium team was one of five winners of the Head Health Challenge III. The competition first began in 2013 when NFL, Under Armour, and GE teamed up to create a competition to improve the safety conditions of American football. As one of the finalists in this year’s competition, Professor Arruda and her colleagues have won a $250,000 award and another year to perfect their prototype. This fall, Michigan high schools are testing two different programs for detecting concussions in high school athletes. Girls’ sports are getting equal attention. The Senate on Tuesday passed measures requiring the Michigan Department of Community Health to develop educational materials and training for athletes, parents and coaches on concussion-related injuries and treatments. The materials would identify the nature and risk of concussions and criteria for removing athletes from activity when they're suspected of having a concussion. Bob Probert was known as an "enforcer" in the game of hockey. The guy who had your back. If an opposing player started something, Probert was there to exact a penalty on the other player with his fists. He played in the NHL for sixteen seasons, including a long stint with the Detroit Red Wings. Probert died last year at the age of 45 after suffering chest pains. The New York Times published a piece this morning on the discovery that Probert suffered from chronic traumatic encephalopathy (CTE) - a brain trauma disease that has also been found in many former NFL players. After learning about CTE, Probert told his wife he wanted his brain donated to researchers. "I remember joking with him, ‘Wouldn’t your brain make a nice specimen?’ ” she said. “He started questioning whether he would have it himself. He told me that he wanted to donate his brain to the research when he died. Who would have thought that six months later it would be happening?" His brain was donated after his death last year. Researchers at Boston University said they found evidence of CTE in Probert's brain. Probert's wife believes it came from all the checking and hits in the game itself. She did note that in his last years, Probert did show signs of "behavior uncharacteristic to him, especially memory loss and a tendency to lose his temper while driving." Wherever the brain trauma came from, the NHL will likely take a closer look at protecting its players, the same way the NFL has been creating new rules to cut down on head trauma in its sport. If they're successful in better protecting their players, the sports have reporters from the New York Times to thank. Times reporters, like Alan Schwartz, have been exposing the effects of head trauma in sports for the last several years. For soldiers fighting in Iraq and Afghanistan, one of the biggest threats has been IEDs, or Improvised Explosive Devices. When these bombs go off, they can do enormous physical damage. But they can also cause damage to the soldier that often goes undetected. NPR's Daniel Zerdling and ProPublica conducted an investigation of Traumatic Brain Injuries (TBIs) in soldiers serving in the U.S. military. In the series, Brain Wars, they found that "the military medical system is failing to diagnose brain injuries in troops who served in Iraq and Afghanistan, many of whom receive little or no treatment for lingering health problems." We're beginning to learn more about the persistent debilitating effects of these brain injuries from studies of football and hockey players and other athletes involved in contact sports. These are unseen injuries. Injuries that, prior to our understanding of them, might have gotten a "shake it off, you just got your bell rung" response from a coach. As it turns out, the military has been slow to understand the effects of these brain injuries as well.